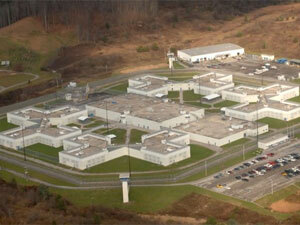 Red Onion State Prison in Pound, Va.
Today (May 22), prisoners at Virginia’s Red Onion State Prison began a hunger strike against inhumane condition in that prison. Red Onion is one of quickly proliferating “supermax” prisons in the United States where torturous techniques are employed as a matter of best practices. The vast majority of the prisoners in Red Onion are held in tiny solitary confinement cells for 23 hours a day and allowed to shower only three times per week. Striking prisoners have highlighted widespread unsanitary practices that endanger their health, including uncooked food. Numerous studies have found long-term solitary confinement to be a form of torture. Even the American Bar Association suggests the practice be limited to no longer than one year. At Red Onion, prison officials estimate the average stay in solitary at 2.7 years. The use of isolation cells in U.S. prisons is a growing trend. Between 1995 and 2000, the percentage of those imprisoned in confinement cells increased by 40 percent, compared to a 28 percent increase in the prison population overall. Roughly 25,000 people are confined in 44 state prisons and across the Federal Prison System. Isolation is employed in the network of U.S. “immigration detention” system, and used along with a variety of other torturous tactics in Guantanamo Bay and other “War on Terror”-related confinement facilities. Those who perpetuate brutal conditions in U.S. prisons do so under the control of the same government controlled by the rich and powerful that carries out a myriad of crimes on a daily basis, both at home and abroad. The Red Onion hunger strike is part of a growing movement among prisoners in the last several years. Prisoners in Georgia, California and several other states have gone on similar strikes demanding basic rights. The growing movement of those behind bars is a crucial element of the struggle against war, racism and exploitation. We urge all supporters of the ANSWER Coalition to support the Red Onion Hunger Strikers as they fight for humane living conditions! Please take a moment now to send a message to Virginia Department of Corrections officials calling on them to meet the demands of the striking prisoners. Everyone is also urged to make phone calls to VADOC Director Harold W Clarke at 804-674-3118 and to ROSP Chief Warden Randall Mathena at 276-796-7510. Read the ten demands of the ROSP Hunger Strikers. by making an urgently needed donation.